Tales of adventure sparkle with fun and mischief in this clever collection!!! Children's book publisher Scholastic has bundled video adaptations of five award-winning picture books on Curious George Rides a Bike... and come up with a treat for youngsters 4 to 9. Kids-lit purists will appreciate the spare animation; the title story and Flossie and the Fox, in fact, are not animated but rather proffer the books' original illustrations accompanied by a narrator's enjoyable readings. 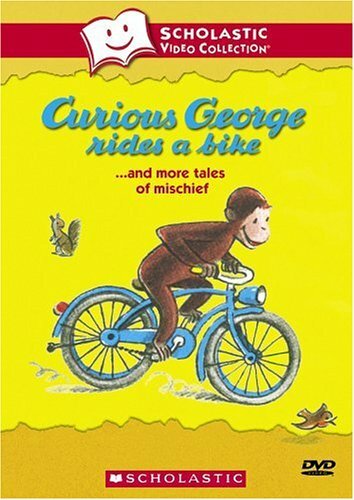 Curious George Rides a Bike is a classic episode in H.A. Rey's series in which George rides a bicycle into several misadventures. The Great White Man-Eating Shark, about a boy who uses his resemblance to a shark to scare swimmers, is even more witty with a touch of animation. The aforementioned Flossie is a cute tale about a girl who outwits a vain fox, while the ironic The Cat and the Canary and The Happy Lion, the latter about a Parisian lion who takes a stroll, both look wonderful here. This DVD also contains exclusive bonus features: 2 full-length bonus stories - The Happy Lion and Cat and Canary, as well as Spanish version of Curious George rides a bike.